The YAML Documenter task scans an extension’s vss-extension.json and task.json files to find the details it needs to build the markdown documentation on the YAML usage. It can also, optionally, copy the extension’s readme.md as the extensions primary documentation. I am starting to use this extension, with my WIKIUpdater extension, in my release pipelines to make sure my extension’s GitHub WIki is up to date. It is going to take a bit of work to update all my pipelines, but the eventual plan is to use the YAML document generator in the builds, adding the readme and YAML markdown files to the build as artefacts. Then deploying these files to the wiki in a later stage of the pipeline. Hope some of you find it of use. I am automating the process by which we keep our build agent up to date. The basic process is to use a fork of the standard Microsoft Azure DevOps Pipeline agent that has the additional code included we need, notably Biztalk. Once I have the Packer created VM up and running, I need to install the agent. This is well document, just run .\config.cmd –help for details. However, there is no option to add user capabilities to the agent. I know I could set them via environment variables, but I don’t want the same user capabilities on each agent on a VM (we use multiple agents on a single VM). A major problem when moving from the graphic editing of Azure Pipeline builds to YAML has been the difficulty in knowing the options available, and of course making typos. I have yet to give it a really good workout, but first impressions are good. It does not remove the need for good documentation of task options, there is a need for my script to generate YAML documentation from a task.json file, but anything extra to ease editing helps. 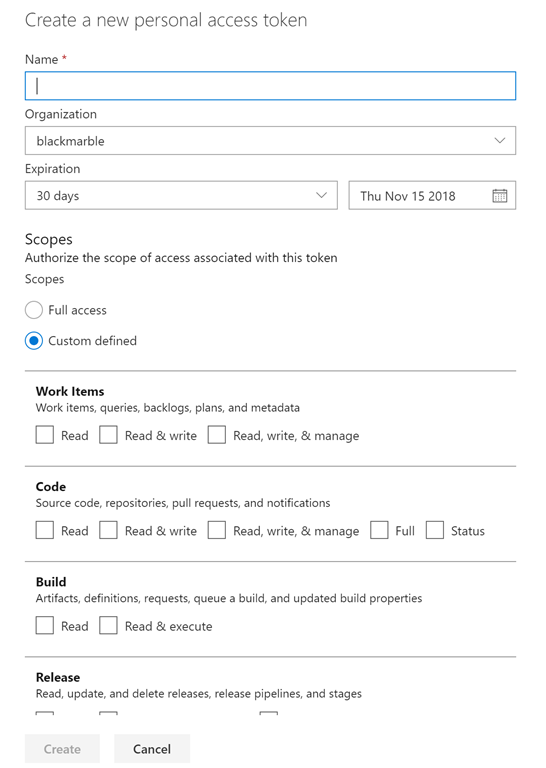 If you are like me for historic reasons you have multiple Azure DevOps organisations (instances) backed by the same Azure Active Directory (AAD). In my case for example: one was created when Azure DevOps was first released as TFSPreview.com and another is from our migration from on-prem TFS using the DB Migration Tools method; and I have others. I make active use of all of these for different purposes, though one is primary with the majority of work done on it, and so I want to make sure the inherited process templates are the same on each of them. Using the primary organisation as the master customisation. Note I have already converted all my old on-premises XML process models to inherited process templates. There is no out the box way to do keep processes in syncs, but it is possible using a few tools. The main one is the Microsoft Process Migrator for Node on GitHub. Firstly I cloned the Microsoft Process Migrator and built it as per the instructions on the repo. [ERROR] [2018-11-26T14:35:44.880Z] Process import validation failed. Process with same name already exists on target account. This was because I had in the past manually duplicated the inherited process template onto this organisation, so there was a process with the same name and fields of the same names. The first error was easy to fix, import the template with a new (temporary) name. As I only had a few duplicated unused fields on a single organisation I picked the former. If I had many organisations to sort out I would picked the latter. As I customise my primary organisation’s process templates I can repeat this process to keep the processes in sync between organisations. Note that in future migrations I won’t have to do steps 2..6 as there are no manually created duplicated fields. So it should be more straight forward. So a valid solution until any similar functionality is built into Azure DevOps, and there is no sign of that on the roadmap. This is another of those posts I do so I don’t forget how I fixed something. I have a requirement to record videos for a client in 720p resolution. As I use as SurfaceBook with a High-Res screen I have found the best way to do this is set my Windows screen resolution to 1280×720 and do all my recording at this as native resolution. Any attempt to record smaller portions of a screen or scale video in production have lead to quality problems, especially as remote desktops within remote desktops are required. 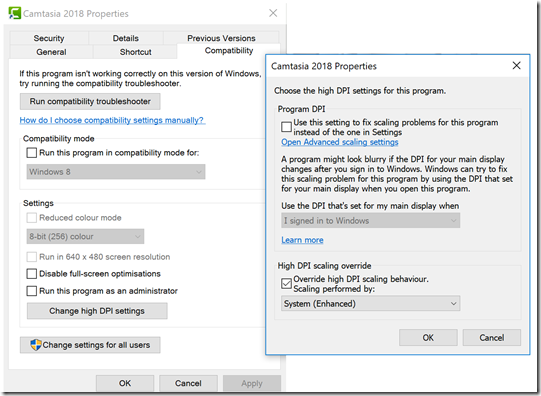 This has been working fine with Camtasia 8, but when I upgrade to Camtasia 2018.0.7 I got problems. The whole UI of the tool was unusable, it ignored the resizing/DPI changes. 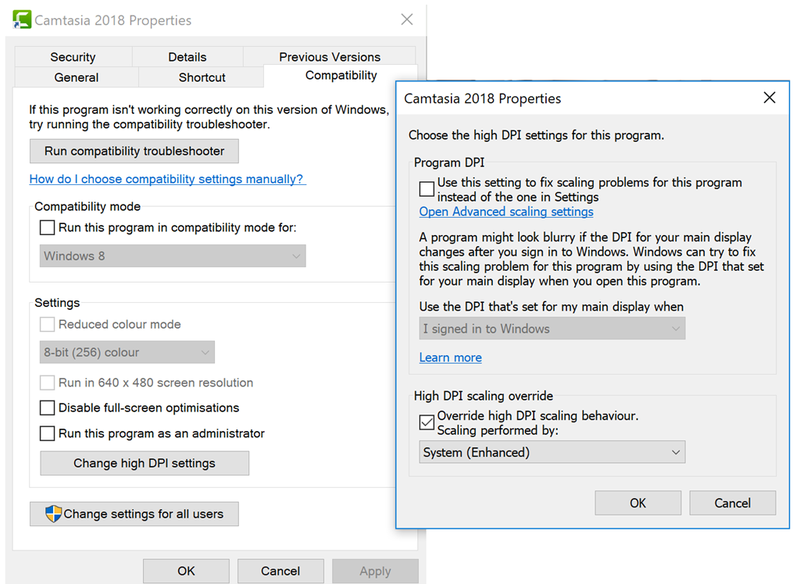 The only fix I could find was to create a desktop shortcut to the EXE and set the Properties > Compatibility > Change high DPI settings > and check the ‘Override high DPI scaling behaviour’ and set this to ‘System’. Even after doing this I still found the preview in the editing screen a little blurred, but usable. The final produced MP4s were OK. 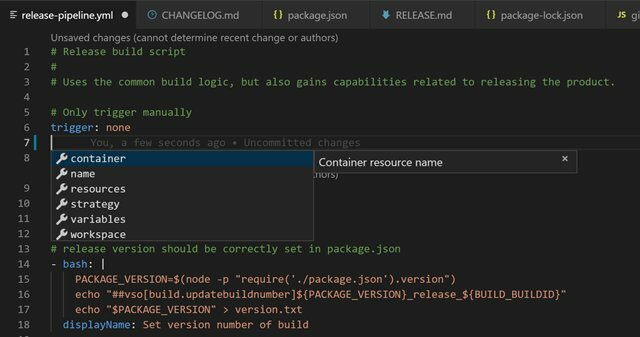 I have just release a new Azure DevOps Pipelines extension to update a page in a Git based WIKI. 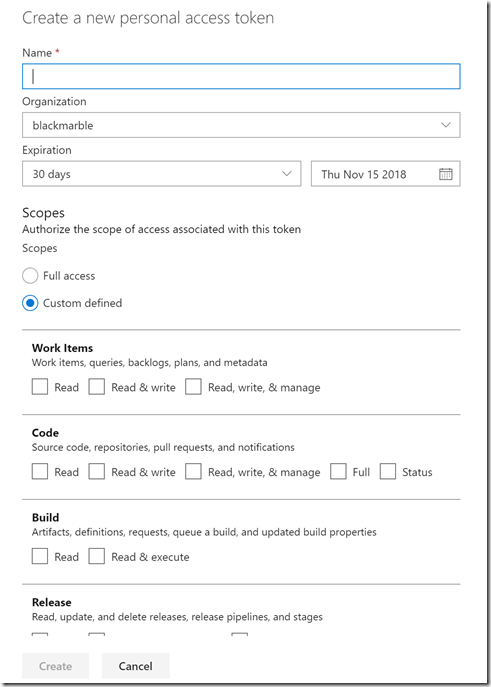 Azure DevOps Services & Server Alerts DSL – an alternative to TFS Aggregator? Whilst listening to a recent Radio TFS it was mentioned that TFS Aggregator uses the C# SOAP based Azure DevOps APIs; hence needed a major re-write as these APIs are being deprecated. Did you know that there was a REST API alternative to TFS Aggregator? My Azure DevOps Services & Server Alerts DSL is out there, and has been for a while, but I don’t think used by many people. It aims to do the same as TFS Aggregator, but is based around Python scripting. However, I do have to say it is more limited in flexibility as it has only been developed for my (and a few of my clients needs), but its an alternative that is based on the REST APIs. msg = "Work item '" + str(parentwi.id) + "' has been set as 'Done' as all its child work items are done"
A single instance of the web site running the events processor can now handle calls from many Azure DevOps instances. There is a general move in Azure DevOps Pipelines to using YAML, as opposed to the designer, to define your pipelines. This is particularly enforced when using them via the new GitHub Marketplace Azure Pipelines method where YAML appears to be the only option. This has shown up a hole in my Pipeline Tasks documentation, I had nothing on YAML! So I have added a YAML usage page for each set of tasks in each of my extensions e.g the file utilities tasks. Now, as are most developers, I am lazy. I was not going to type all that information. So I wrote a script to generate the markdown from respective task.json files in the repo. Now this script will need some work for others to use as it relies on some special handling due to quirks of my directory structure, but I hope it will be of use to others. Azure DevOps has had some serious issue over the past couple of weeks with availability here in Europe. A really good open and detailed root cause analysis has just been posted by the Azure DevOps team at Microsoft. It also covers the mitigations they are putting place to make sure this same issues do not occur again. We all have to remember that the cloud is not magic. Cloud service providers will have problems like any on-premise services; but trying to hide them does nothing to build confidence. So I for one applaud posts like this. I just wish all cloud service providers were as open when problem occur. It may have passed you by, it had me as I had not created a PAT for a while, but managing custom security for PATs in Azure DevOps is much easier since Sprint 140. You now get some help to pick the correct ‘limited’ rights set by the simple grouping of rights.